HOUSTON - The Columbia Accident Investigation Board (CAIB) issued a new version of a master time line showing the progression of events that led to the destruction of the shuttle and loss of its crew. On the newly released document, a series of five drop-outs in communication from the space plane are noted prior to the first indication of reentry heating on the space plane. These "unexpected return link" drop-outs are listed as "out-of-family" based on comparison with an earlier mission heading back to the Kennedy Space Center on the same trajectory. The new NASA-developed time line called REV 15 Baseline -- shows the space plane in trouble earlier in its dive toward Earth than previously thought. In one notation, the space plane is listed at an altitude of 227,400 feet, crossing from California into Nevada, speeding at March 22.5. Numbers of pieces of Columbia have been shed by this time. Seconds later, a first bright flash is observed from the ground, followed by a bright piece of debris leaving Columbia. The new time line shows that a very faint fragment debris #16 falls from the space plane over New Mexico. Minutes later, guidance and navigation data available suggests that Columbia was flying in an "uncommanded attitude and exhibiting uncontrolled rates." 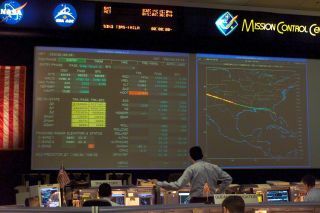 During the last few seconds prior to final loss of signal from Columbia , a number of systems in the left wing of the orbiter were not functioning. Yet other key equipment remained in apparent workinag order. As example, Auxiliary Power Units that drive control surfaces on the space plane were still running. Communication and navigation aids in the forward fuselage were performing nominally. It is also noted that the environmental control life support system for the crew was performing nominally, prior to the main body of the vehicle breaking up. Early next week, March 17-18, the CAIB holds the second public meeting here at a local hotel, outside the gates of the NASA Johnson Space Center. Tyrone Woodyard, a CAIB spokesman, told SPACE.com that invited experts will discuss in detail the NASA-produced time lines, as well as provide updates on debris recovery and information on aerodynamic and thermal issues related to Columbia's fatal reentry.